Ancient dolmen in farmer's field above the River Kenmare, Co. Kerry. If I could be dropped anywhere in Ireland with my camera and lenses, I’d choose the region of Munster nearly every time. The spectacular cliffs on the coast of Clare, the wild headlands of the Kingdom of Kerry – the landscape is rugged and the coastline endless. But photography is so much about light, and isn’t the weather still … well, Irish? And yet, if photography were predictable it wouldn’t be an art. An Irish sky is “completely covered by cloud well over 50 percent of the time,” according to the Meteorological Service. So even if you’ve composed the best shot in all of Erin, your image might still look flat and shapeless. 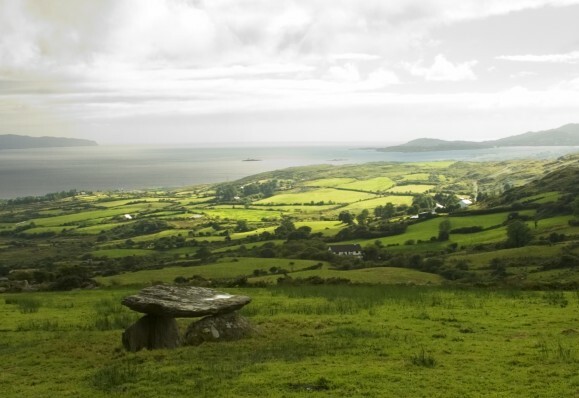 But unpredictable breaks from the norm can make the Irish landscape come alive. A sunbeam finds a gap in the clouds and lights up a valley lake. A splash of light hits water droplets in the distance, throwing a rainbow across your frame. These happy accidents illuminate details, add depth and contour, and appear so dramatic precisely because they’re surrounded by shadowed hills or dark clouds. Lightscapes like these are breathtaking, and fleeting – and breathtaking precicely because they’re fleeting. Serendipity is much of what makes photographing in Ireland so rewarding. Even when the sun makes no appearance all day, I’m still always glad I lugged my camera. The rain and dew so common there make the green all around you vibrant and saturated. And a cloud cover is perfect for photographing people; the diffuse light reduces hard shadows and spares subjects from squinting, making faces soft and natural. Most of my visits to Ireland have landed in the summertime, but I once found myself in Kerry in November, amazed by how different the landscape looked. Instead of the endless green I’d come to expect, I saw gold everywhere. As autumn comes, many plants (like ferns) turn brown, and even the light itself is a warmer hue. The arc of the sun falls lower and – if enough of the sky is clear – more and more of the day resembles the so-called “magic hour,” so sought-after by photographers. The light is golden and its shadows are soft and long, like a never-ending sunset. Just as you never know what light you’re going to have to shoot with, you often don’t know just what you’ll find to shoot. I was surprised to come across horses after landing on an apparently uninhabited island while kayaking the Kenmare River. I wandered upon an ancient abbey and cemetery (and the three Celtic cross headstones) while walking coastal bluffs in southwest Kerry. As morbid as it sounds, I find cemeteries compelling to explore. They’re alive with history, full of intriguing details, and, in Ireland, so seamless with the grass and ivy in their midst and the hillsides and coastlines beyond that, to me, they’re part of the natural landscape. Many of Munster’s natural features are mapped and signposted, and some of those spots are indeed exceptional, not least of which are the Cliffs of Moher. The most photographed view is probably from the lookout at O’Brien’s Tower. But an old path (since re-routed) runs for several kilometers from the visitors’ complex to the town of Doolin and offers infinitely more perspectives, enhancing the itch to explore the cliffs rather than just visit them. When I look at the images I shot there I am viscerally reminded of the breathtaking heights of the cliffs. 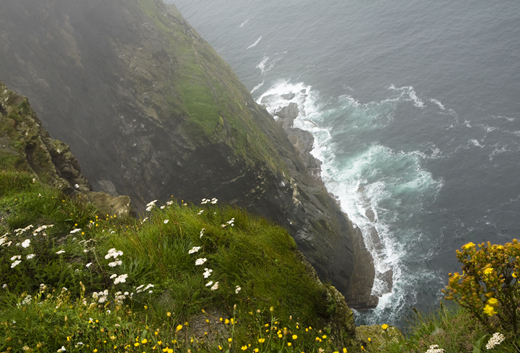 In one photo (above), the precarious old trail passes mere inches from the edge of Ireland and yellow flowers and soft grass spill over the edge to the wave-pounded rocks far below. It’s those happy surprises you stumble across when you leave the main path and those exquisite, unpredictable moments of heavenly light that keep pulling me back to Munster, to see what the next day will bring and discover what’s around the next bend. 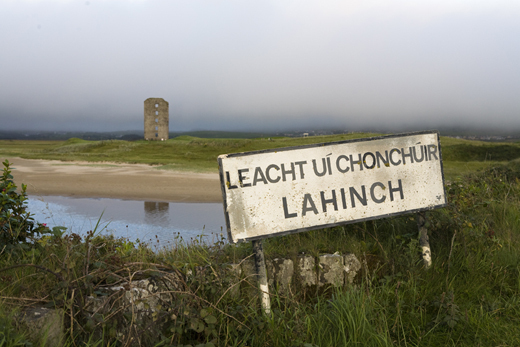 Lahinch town sign in Gaelic and the remains of Dough Castle, Lahinch. 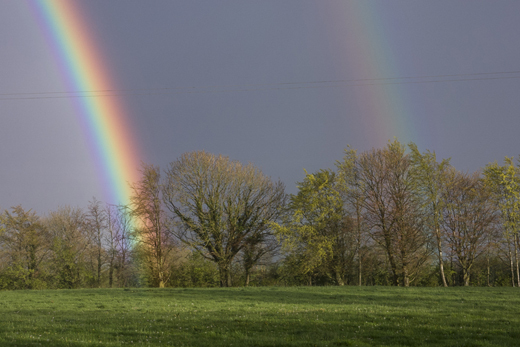 Double-rainbow in farmer’s field, County Tipperary. 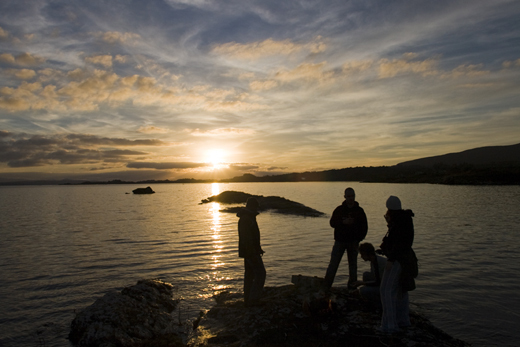 Friends lighting an evening bonfire on the shore of Kenmare Bay, County Kerry. 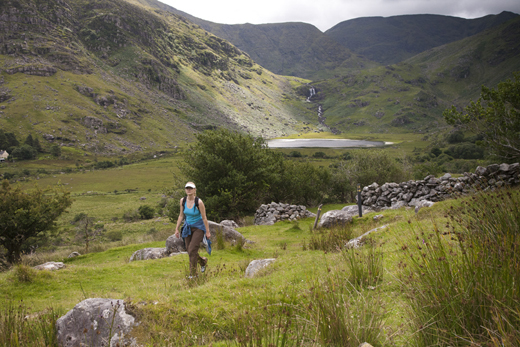 Hiker on the Kerry Way in McGillycuddy Reeks, Black Valley, County Kerry. 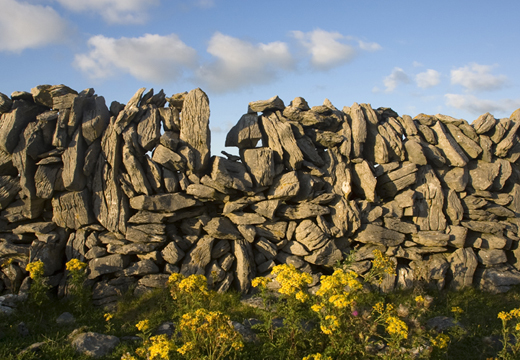 Farmer’s stone wall in late-evening evening sunlight, County Clare. 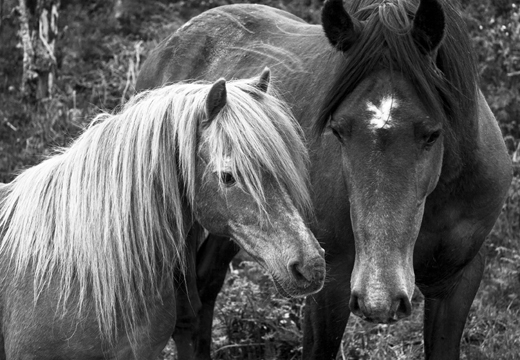 Free-roaming horses on an island in Kenmare Bay, County Kerry. 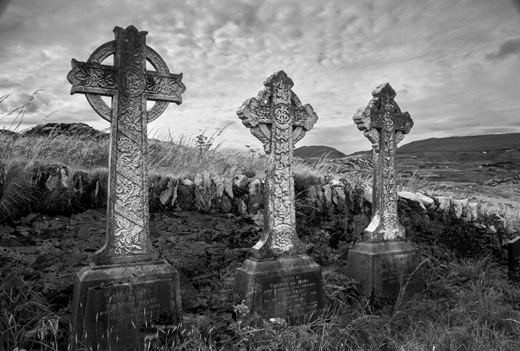 Celtic cross tombstones at a church graveyard on Abbey Island, County Kerry. View over the Cliffs of Moher, County Clare. 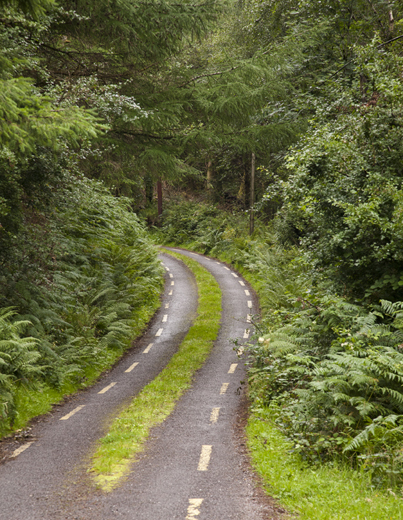 A single-lane country road, interior of County Kerry. Ireland is such a beautiful land, world renowned.